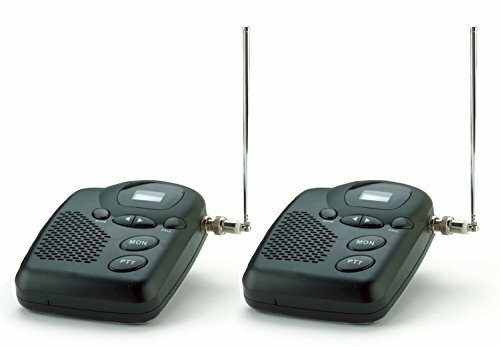 The MURS Wireless Intercom System is fully expandable to an unlimited number of intercom base stations and hand-held MURS radio walkie-talkies for mobile communication while you are traveling around your property. The MURS Wireless Intercom System is fully digital and offers high-quality sound and secure connections. How to use: Plug in intercoms and turn to the same channel. Press the PTT (Push-to-Talk) button to communicate to all other intercoms on that channel. Press the Call button to page another intercom. Monitor mode lets you listen to all sub-channel communication on a particular main channel. Each base station measures approximately 6” x 5.5” x 1” (excluding antenna). Power: Included plug-in adapters, 12V DC. For indoor use only. Not waterproof. Set of two base stations included but fully expandable to an UNLIMITED number of MURS intercoms. SUPER EASY to set up. No pairing required, just turn to the desired channel. 5 channels and 38 sub-channels.